5/365(+1), a photo by Luca Rossini on Flickr. Today it seemed I couldn’t find any inspiration for the daily shot. 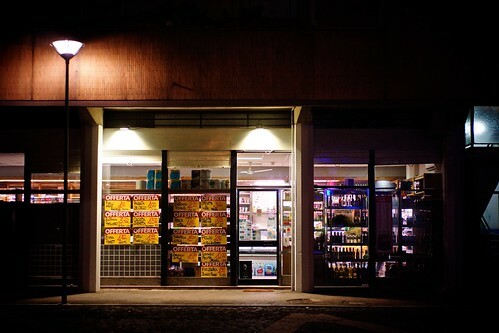 After several attempts of shooting out of the window with a tele lens and tripod, I left to buy some dinner. While I was waiting the pizzas to be ready, my attention got caught by the grocery store in piazza Grecia, our neighborhood’s square. The 35mm is just the perfect glass for these kind of geometric urban landscapes, and the color-skopar is crystal clear when it comes of capturing all the subtle tones of night lights. And now… time for pizza!